Were you a fan of Alice's Adventures in Wonderland as a child? Surprisingly, not really. I don't recall reading the book, although I know that at some point, I must have. I really only knew the Disney movie, and what I knew of that mainly came from riding the Mad Tea Party ride at Disney World. What drew you to writing a novel about Alice Liddell, then? I saw an exhibit at the Art Institute of Chicago several years ago, titled "Dreaming in Pictures: the Photography of Lewis Carroll." I did not know that Lewis Carroll was a pioneer in photography; I did not even know that Lewis Carroll was a pseudonym for Charles Lutwidge Dodgson. Certainly I had no inkling that there had ever been a "real" Alice! Once inside the exhibit, however, I was startled by the images Carroll—Dodgson—had taken; they were all prepubescent little girls. One photograph in particular captured my fancy; it was of a girl clad in rags, staring at the camera with a very frank—very adult—gaze. The caption informed me she was 7-year-old Alice Liddell, the daughter of Dean Liddell of Christ Church, Oxford, where Dodgson taught mathematics. The caption also said she was the inspiration for Alice's Adventures in Wonderland. So you then decided to write about her? No! Even though I said to myself, "Hmmm...I wonder what ever happened to her?" I completely put it out of my mind while thinking about other writing projects! It wasn't until a few years later, when my friend Nic was visiting me from Australia and I took her to the Art Institute, that I remembered that earlier exhibit. Nic was the one who literally shoved me in front of the computer and told me I had to write this story; once I caught her enthusiasm and began to research it, the story just poured out of me. Through that research, then, I was re-introduced to the classic story; I read both Alice's Adventures in Wonderland and Through the Looking Glass, and was charmed and surprised. They were nothing like I had thought; I remain astonished at how clever a writer is Carroll, especially his playfulness with language. Had you written any kind of historical fiction before? No, and I have to say my ignorance of the genre was a blessing; had I been at all conscious of any kind of rules or conventions, I might have chickened out! I was fortunate in that not a lot is written of Alice Liddell; while there are tomes and tomes written about Lewis Carroll, much of her life is only generally documented beyond her obviously intriguing childhood, and her curious relationship and break with Dodgson. While this, naturally, intrigued me as well, I was also interested in how she lived her life after Wonderland; how she tried to leave it behind before ultimately embracing it near the end of her life. As an historical novelist, are you more concerned with sticking to the absolute historical truth, or telling a good story? Story first, always! Sometimes you have to condense known facts or dates, or maybe move them around a little, in order to put focus on the story you want to tell. Or you have to leave them out, if they don't really move that story along. That said, I would never introduce, knowingly, any anachronisms, nor would I have the audacity to plunk known historical characters down in situations or events where it is absolutely recorded they were not present. I tend to concentrate on what happens between these well-known events and situations. And I do think I strive for an emotional truth, at least as I see it, at all times. But yes—in the end, there's a reason why this is called fiction, not biography. Readers want to learn, that's true; they also want to be entertained or moved or transported. That's my first responsibility as an author—to tell a good story. Hopefully, then, it will inspire the reader to want to do more research about these people after they read the book. In Alice I Have Been, you highlight three periods of Alice Liddell's life: her childhood, which encompasses her famous encounters with Charles Dodgson; her life as a young woman in Oxford's Victorian heyday; and her later life as a wife and mother who becomes fiercely protective of her family during WWI. Why did you decide to focus on these three eras in Alice's life, and which one was the most challenging to evoke? Are you equally drawn to all three, or do you have a favorite? 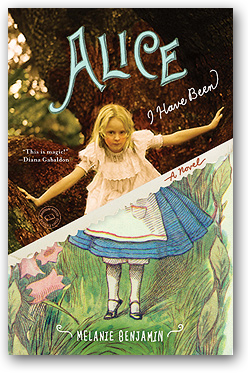 As I was researching Alice's life, three major aspects seemed to speak to me—the childhood, obviously, which remains so fascinating to fans of Lewis Carroll; the possibility of romance with Prince Leopold; the fact she had three sons who fought in World War I. So concentrating on these three distinct time periods—which really span most of the Victorian era—made the most sense, and I knew that thematically, the link between them all was always going to be Wonderland, or rather—the impossibility of Wonderland, after all. I think I loved writing the second part the most; I really felt myself getting into an almost Gothic spirit while writing it. The first section was probably easiest to write, however; the third, the most difficult. This was where there were so many gaps in Alice's story; she simply went away to Cuffnells for years and years, only re-emerging near the end of her life with the auction of the book. Yet during these years, she raised three sons whom she would have to send to war; this intrusion of bigger events sometimes made it more challenging to keep Wonderland and Dodgson still in the center of the story in that third section. In the novel, Alice embarks on a romantic relationship with Leopold, one of Queen Victoria's sons. How much of this relationship is factual—did they really fall in love? It depends upon what source you read. The fact that Leopold spent a lot of time at the Deanery—and with Alice and Edith (Ina having already married by then)—is well established. He appears to have relished his experience at Oxford, for it was the first time he was able to live something of a "normal" life, as his hemophilia had prevented it up to that point. Anne Clark's The Real Alice definitely proposes that Leopold and Alice were romantically involved; the only complete biography of Leopold ventures that it was Edith whom he loved. Other more anecdotal evidence suggests Alice—although no one appears to be in agreement as to who put a stop to the romance, Queen Victoria herself or Alice's mother. Whatever the Prince's feelings, the fact remains that Edith was engaged to marry another man. And Leopold did give Alice a diamond horseshoe pin which she wore on her wedding day; he also named his first daughter "Alice," while she named her second son "Leopold." Alice's family seemed to have noticed a definite, rather permanent, air of sadness to her after the death of Prince Leopold. These are the facts that spoke most loudly to me. We rarely hear about Alice Liddell's sisters; yet in your account she has an intense relationship with them. Can you tell us a bit about what they were like, as siblings and as children? Ina was three years older than Alice, Edith two years younger. Harry, the eldest Liddell child, was two years older than Ina but the separation between the sexes was great in those days; the boys were sent off to school while very young, and were usually educated by a tutor beforehand, while the girls remained under the care of a governess from the nursery until they were officially "out." Between Ina and Alice, and then Edith and the next girl, Rhoda, two boys were born but died in infancy. There was a gap between Edith and Rhoda of five years. This left the three sisters together, for companionship and for schooling, most of their girlhood. Their mother was very busy as the social queen of Christ Church, when she wasn't very busy having more children (she would eventually have ten). Yet Mrs. Liddell was very proud of her three daughters and enjoyed dressing them in the finest of clothing, always alike, as is evident in the many photographs Charles Dodgson took of them. The sisters also sat for the painter William Richmond. It always seems to be the three girls, exclusively, that these artists found most charming. Mrs. Liddell seemed to view them as an asset, socially; she had them perform songs together at gatherings, for example, and was known to be very ambitious about their marriage prospects. Naturally, the girls must have been very close, particularly growing up in such a male-dominated place as Oxford. There are very few mentions of other female friends in their lives. But I can also imagine there were jealousies, as well; how did Ina and Edith feel about the fact that even though they also were present that afternoon, it was to Alice that Dodgson dedicated his immortal story; Alice whose named lived on? We can only imagine, since a veil of secrecy seems to obscure all mention of Dodgson—and Alice—in their later lives, until Alice decided to sell the manuscript in 1928. Do you think it's possible for children who have been immortalized in fiction to lead "normal" lives? Or are they always overshadowed by their fictionalized characters? Well, the Llewelyn-Davies boys—whose lives were changed forever by J.M. Barrie and Peter Pan—certainly had their share of troubles growing up; at least one of them—Peter himself—later committed suicide (the circumstances surrounding the drowning death of Michael remain mysterious). Christopher Milne, the inspiration for Christopher Robin in the Winnie the Pooh stories, also had difficulties with his legacy; he grew to resent his father for what he saw as the exploitation of his childhood and was practically estranged from him in the end. So no, I'm not sure it is ever possible for them to live a normal life. I tried to show Alice Liddell making peace with her legacy, but she only did so at the very end of her long life. For much of it, it really appeared to me she was trying to do her best to escape Wonderland. Is there one thing you would like to say to authors? One piece of wisdom or insight? Open your eyes—get out of the house! I think that authors, very often, get stuck in a rut; they spend their time alone, concentrating on one thing—one story, one novel, one idea—and fixate on it. Some spend years and years reworking the same idea. I was close to being in this place—and then I took the train into Chicago and wandered into a photography exhibit, which changed my life as an artist. Authors need to experience life, and art, and keep their minds—and eyes—open to every possibility. We can't remain chained to our computers all the time.